Drunk Nothings: Why I Walk! The walk is fast approaching and so far my wife has come up a bit short (or really short) in her goal to raise money for the NSTAR Walk for Childrens Hospital. If you feel like helping out and donating please click the link below. Every little bit helps. Just remember your donation could save a sick child's life. 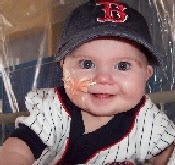 I'm walking in NSTAR's Walk for Children's Hospital in memory of Hanah Rose McLeish. I am also walking in support of all the children and families Children's Hospital has helped in the past and will help in the future. These families and children have so much courage it is inspiring, so please donate and help make their lives healthier and happier!